Violinist Sandra McDonald is assistant concertmaster of the Arkansas Symphony Orchestra. A veteran symphonic performer, this is her 37th season with the orchestra. She is a founding member of Mariposa with Linda Holzer, and also performs as first violinist in the Da Capo Quartet. In 2009, she was the recipient of a Governor's Arts Award in the category Individual Artist. Her teaching career involves maintaining an active violin studio at "Adventures in the Arts," a fine arts academy run at Pulaski Heights Methodist Church in Little Rock. Additionally, she serves on the summer faculties of the Wildwood Academy for Music and the Arts, and the Adult Amateur Chamber Music Camp in Little Rock. She is certified as a Suzuki violin teacher, having trained with Suzuki pedagogues Allen Lieb, Alice Joy Lewis, Linda Steig, Nancy Jackson, Barbara Barber, and Thomas Wermuth. and her students include both Suzuki and traditional students. A native of Ohio, she holds the BM degree from Bowling Green State University, and pursued graduate study at the University of Arizona-Tucson and the Aspen Music Festival. 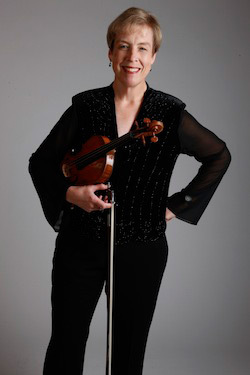 Well-known to audiences throughout Arkansas for her collaborative participation in a wide range of musical events and ensembles, Ms. McDonald served as second violin of the Quapaw Quartet for 11 years and was a founding member of that ensemble. She was formerly an Adjunct Instructor of Violin at Hendrix College for 7 years, and a guest clinician at the Suzuki Institute in Atlanta.